It’s hard to believe that apple picking season is here! It’s a quintessential fall activity for many families, and Champaign-Urbana is no different. In Central Illinois, apple picking season generally starts in late July/early August and goes through October, but varies greatly from farm to farm. Some varieties ripen earlier/later than others. To be sure that there are apples available and ripe for the picking, we recommend that you call ahead before you go to any farm (some also put up information on their Facebook pages and/or websites). Some farms have limited quantities, and the seasons can be short. 1) Bring water to have in the field and use the restroom before you go into the orchard – you never know how far away you might get. 2) Where there is fruit there is often bugs. Go early in the day as possible; wear closed toe shoes and bring bug repellent. 3) Apples are HEAVY! Some places provide wagons; others do not. Another reason to call ahead if you don’t know. 5) It’s difficult for younger kids to pick apples without help from a grownup. You can buy your own apple picker contraptions to bring along, which are inexpensive; some orchards have them. I’ve seen people bring ladders! 6) Bring your own bags if you can. You didn’t think it could be anyone else first on the list, did you? We love our friends at Curtis Orchard and Pumpkin Patch, with its amazing range of activities and the entire fall. But at its core (see what we did there) Curtis Orchard is a working farm and the apples are the main attraction. Location: On Duncan Avenue, south of Curtis Road in Champaign. Notes: Curtis Orchard is open from July 20 until December 24, and they have apples available most of that time. You can see what varieties are available when on its website. You can even sign up to get emails when certain varieties are ready. However, not all varieties are available for picking. Wagons provided. Other attractions: Plenty! Some are free, but others aren’t. We detail everything Curtis Orchard over HERE. A traditional apple orchard with lots of varieties. Family owned and operated. Location: Located outside of Sullivan, Illinois in Moultrie County. Use the directions from its website. Evidently GPS systems including Google won’t reliably get you there. About 75 minutes from Champaign-Urbana. Not far from other attractions including Amish country and Aikman Wildlife Adventure. Notes: Open Monday – Saturday: 9am – 5pm. Sunday: 12pm – 5pm. Some fall weekends they may have lunch available. Other attractions: A large playground area and a separate preschool play area is available on site. Orchard offers tours as well as cider demonstrations starting in September, must get reservations in advance. Both of these orchards are on the other side of Peoria, meaning they are about 2 hours away. Christ Orchard, Elmwood, Illinois. Apple picking only available mid-September to mid-October. Closed Sundays. Tanners Orchard, Speer, Illinois. More akin to Curtis Orchard with a wide variety of activities available in addition to apple picking. Beginning the first Festival Days of September, you can catch a wagon ride out to the orchard and pick your own apples. They offer more than 11,000 U-Pick apple trees and 17 varieties of apples. Looking for other fruits to pick? 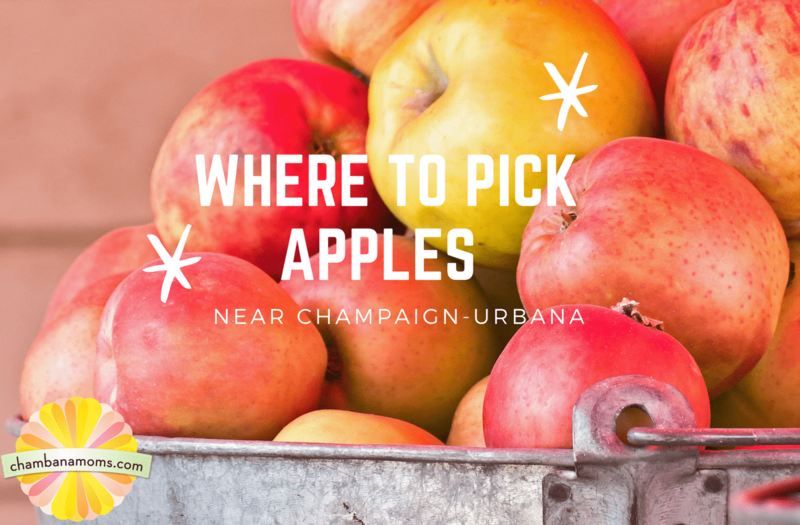 Did we miss your favorite apple orchard near Champaign-Urbana?